This wardrobe or clothes closet would be great in a bedroom where closet space is limited or where there is no closet at all. Click here for detailed wardrobe plans. This wardrobe provides ample room for hanging suits, dresses and other apparel, as well as space for boots and shoes. It can be made of any of the several furniture woods in common use, but quarter-sawed oak will be found to give the most pleasing effect. The stock should be ordered from the mill ready cut to length, squared and sanded. In this way much labor will be saved. 4 posts, 1-3/4 by 1-3/4 by 64-1/2 in., S-4-S.
2 front rails, 3/4 by 1-1/2 by 37-1/2 in., S-4-S.
1 top and 1 bottom board, each 3/4 by 18-1/2 by 37 in., S-4-S.
1 top back rail, 3/4 by 4-1/4 by 37-1/2 in., S-4-S.
1 lower back rail, 3/4 by 4 by 37-1/2 in., S-4-S.
6 end rails, 3/4 by 6 by 18-1/2 in., S-4-S.
4 end uprights, 3/4 by 4 by 22-1/2 in., S-4-S.
8 end panels, 3/8 by 7-1/2 by 22-1/2 in., S-4-S.
5 shelves, 3/4 by 17-3/4 by 19-1/2 in., S-4-S.
2 drawer fronts, 3/4 by 4-3/4 by 8-1/2 in., S-4-S.
1 door, 3/4 by 7-3/4 by 10 in., S-4-S.
1 shelf partition, 3/4 by 10 by 19 in., S-4-S.
2 drawer fronts, 3/4 by 7 by 17 in., S-4-S.
1 drawer front, 3/4 by 8 by 17 in., S-4-S.
1 partition (several pieces), 3/4 by 19-1/2 by 57-3/4 in., S-4-S.
4 door uprights, 3/4 by 2-1/2 by 57 in., S-4-S.
2 top rails, 3/4 by 3-1/2 by 14-1/2 in., S-4-S.
2 middle rails, 3/4 by 6 by 14-1/2 in., S-4-S.
2 lower rails, 3/4 by 4-1/2 by 14-1/2 in., S-4-S.
4 center uprights, 3/4 by 2-1/2 by 23 in., S-4-S.
8 panels, 3/8 by 6 by 22-1/2 in., S-4-S.
4 pieces, 3/8 by 4-3/4 by 19 in., soft wood. 2 pieces, 3/8 by 8 by 19 in., soft wood. 2 pieces, 3/8 by 4-1/4 by 8 in., soft wood. 4 pieces, 1/2 by 7 by 19 in., soft wood. 3 pieces, 1/2 by 16-1/2 by 19 in., soft wood. 2 pieces, 1/2 by 6-1/2 by 16-1/2 in., soft wood. 2 pieces, 1/2 by 8 by 19 in., soft wood. 1 piece, 1/2 by 7-1/2 by 16-1/2 in., soft wood. 1 back (several pieces), 3/8 by 36 by 58 in., S-2-S.
First be sure the posts are perfectly square and of equal length. The upper ends can be chamfered or rounded if desired. The two front posts are alike, as are the back ones. The mortises should be laid out in each pair of posts and then cut with a sharp chisel, or they can be left until the tenons are all made, and then marked and cut from each tenon. Grooves should be cut on one side of all the posts to take the end panels. The front and lower back rails are plain except for the tenons at each end, but the end rails and the center uprights should have grooves cut for the panels the same as the posts. The top back rail serves as a top back board and should have the corners rounded as shown in the detail drawing. The frame can now be assembled. Glue should be used on all the joints as it makes them much stiffer. Be careful to get the frame together perfectly square, or it will be hard to fit the doors and the shelves. The top and bottom boards should have the corners cut to clear the posts. The closet is divided into two compartments by a partition. 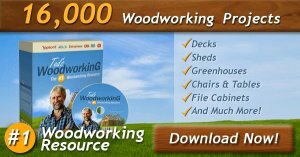 This can be made of plain boards or panels similar to those in the ends, as desired. Place the shelves in position as shown. They are held in place by means of cleats and screws. 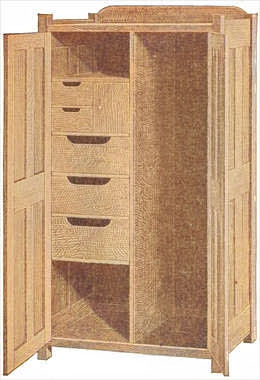 The one shelf has a partition in its center with a door on one side and two small drawers on the other. Drawers should be fitted to three of the other compartments. They are made in the usual manner except that the front boards should be cut out at the top for a handhold as shown. The doors are fitted by a tenon and mortise joint at the ends. They have a centerpiece and panels to match the ends of the closet. Suitable hinges and a catch should be supplied. These can be purchased at any hardware store. The backing is put on in the usual manner. It should be finished on the front side. When complete, the closet should be carefully gone over with fine sandpaper and all glue and rough spots removed. Apply stain of the desired color. This may be any of the many mission stains available.